Before the North Carolina Railroad was completed in 1856, a crop failure in the west prompted citizens to push for a railroad to connect the eastern and central counties with Asheville. In response, the legislature agreed to build two important extensions of the North Carolina Railroad-the Atlantic & North Carolina Railroad from Goldsboro to Beaufort and the Western North Carolina Railroad from Salisbury to Morganton. The route from Goldsboro to Beaufort was finished in 1858, but work on the Salisbury-to-Morganton track was very slow and costly. After the Civil War, which virtually halted construction, the state in 1866 subscribed $4 million to the Western North Carolina Railroad to continue the project. John A. Hunt finished the rest of Charles F. Fisher's work east of Morganton, and plans were made for completion of the next section from Morganton to Old Fort. With no ready cash on hand, the railroad's president and stockholders were eager for governmental aid. The state constitutional convention of 1868 and the Republican State Convention authorized the issuance of bonds totaling $6.4 million to extend the road from Morganton to Asheville. In the same year George W. Swepson and Gen. Milton S. Littlefield secured absolute control of the Western North Carolina Railroad by purchasing 2,000 of the 3,080 bonds issued. The railroad then became a victim of Swepson and Littlefield's corruption. During the administration of Governor William W. Holden, the two men issued worthless securities, participated in fraudulent stock subscriptions, and built a huge debt. The road was pillaged, Littlefield and his cronies fled the state, and Holden was impeached. After the so-called Littlefield scandal, the state bought the Western North Carolina Railroad for $665,000 in 1870. The same year the Democratic-controlled legislature cut off financial support to the railroads and leased the Western North Carolina to other companies such as the Richmond & Danville Railroad. Construction of the Western North Carolina Railroad stopped in Murphy in 1891 before an extension to Ducktown, Tenn., could be completed. In 1894 the railroad was reorganized as the Southern Railway Company. William Hutson Abrams Jr., "The Western North Carolina Railroad" (M.A. thesis, Western Carolina University, 1976). Cecil Kenneth Brown, A State Movement in Railroad Development: The Story of North Carolina's First Effort to Establish an East and West Trunk Line Railroad (1928). "The Case Of Milton S. Littlefield." The New York Times. July 29, 1879. http://select.nytimes.com/gst/abstract.html?res=F20616FA345B137B93CBAB178CD85F4D8784F9 (accessed August 1, 2012). 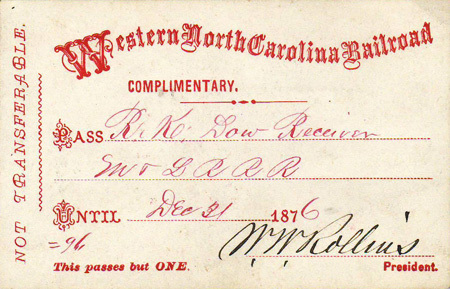 A Bill to Incorporate the Western North Carolina Railroad Company. Raleigh, N.C.: Seaton Gales. 1852. http://archive.org/stream/billtoincorporatewester#page/n1/mode/2up (accessed August 1, 2012). Western North Carolina Railroad Company. Proceedings of the General Meeting of Stockholders of the Western North Carolina Railroad Company. Salisbury, N.C.: The Banner Office. 1855. http://digital.ncdcr.gov/u?/p249901coll22,28096 (accessed August 1, 2012). Western North Carolina Railroad Company. Second Annual Report of the Presidents and Directors to the Stockholders of the Western North Carolina Rail Road Company Together with the Proceedings of the Stockholders. Salisbury, N.C.: The Watchman Office. 1856. The Select Committee. "Report of the Select Committee to Inquire into the Expediency of Selling the State's Interest in the Western N.C. Railroad." 1866. Western North Carolina Railroad Company. Annual Proceedings of the Western No. Ca. Rail-Road with Reports of Officers for 1869. Statesville, N.C.: Drake and Son. 1869. Western North Carolina Railroad Company. A record of the acts and charter, (original and amended,) of the Western Division of the Western North-Carolina Railroad. Asheville, N.C.: The "Pioneer" Office. 1869. http://archive.org/stream/recordofactschar00west#page/n3/mode/2up (accessed August 1, 2012). Clark, Walter. "Western N.C. Rail Road: The Mud-Cut Circular as furnished by the Author to The Raleigh News, Nov. 21, 1879." [Raleigh, N.C.] 1880. "Railroads - North Carolina" Vertical Reference File, Government and Heritage Library, North Carolina. "The Western North Carolina Railroad, in Litigation." 1882. "Railroads - North Carolina" Vertical Reference File, Government and Heritage Library, North Carolina. Passenger Department, Western North Carolina Railroad Company. Illustrated Guide Book of the Western North Carolina Railroad Company Now Completed From Salisbury to Paint Rock. Philadelphia: Allen, Lane & Scott. .
Connor, R.D.W. "The Western North Carolina Railroad." Program Of Exercises For North Carolina Day (Western North Carolina). Raleigh, N.C.: Edwards & Broughton Printing Company. 1909. p. 64-67. http://digital.ncdcr.gov/u?/p249901coll22,460600 (accessed August 14, 2012). Lathrop, Virginia T. "Western North North [sic] Carolina Railroad Causes Men to Marvel." Greensboro Daily News. September 28, 1930. "Railroads - North Carolina" Vertical Reference File, Government and Heritage Library, North Carolina. "Pass, Boarding, Accession #: S.HS.2012.1.602." 1876. North Carolina Historic Sites. 1 January 2006 | Castano, Vincent; Kern, Donald W.
Today is 9-12-18. I have no reply to the question on 9-2-18. I went to the chat and sent a note. I wait 5 hours and no response from that either. Was my question something that you could not answer? Thank you for visiting NCpedia and for taking the time to share your question and let us know that your question was overlooked. I apologize for this. If you are looking for this additional information, you may want to look at a few things. First, the authors of the article included their sources in the “References” section just below the article text. We also incorporated “Additional Resources” – many from the original documentary history of the company that have been digitized. Second, if you click on the link to Southern Railway Company in the last paragraph, you will go to the NCpedia article -- https://www.ncpedia.org/southern-railway-system. You’ll also find references and additional references. The Southern Railway was the outcome of the reorganization and merger of many rail lines over a long period beginning in the 1830s. We would have to locate the corporate and state chartering documents in order to prove the 1894 date, but form the sources I have looked at, this is the established date. If you look at the references included, you will probably come upon citations for this. Here is also a link to the Master’s thesis included in the references -- https://libres.uncg.edu/ir/wcu/f/1976AbramsWilliamHudson.pdf. In the thesis, he mentions a publication A History of the Legal Development of the Railroad System of the Southern Railway Company. That has been digitized and is available at https://catalog.hathitrust.org/Record/000970044. That would probably be an excellent place to look. I hope this helps! And I do apologize for the delay in responding to your question. In the last statement of the article it states that in 1894 Western was reorganized as Southern where would I find that documentation to back up that claim?